Elegantt Pro lets you set milestones throughout your project’s lifespan. You can use milestones to remind your team of important upcoming events or simply to keep track of past releases of your product. To create a new milestone, simply click on the Milestones line located between the timescale and your Elegantt chart. Its due date will be pre-filled based on where you clicked on the timescale. You can then choose the title of your milestone and change its due date if necessary. You can also assign one of your team members to this particular milestone by clicking on the Lead avatar. 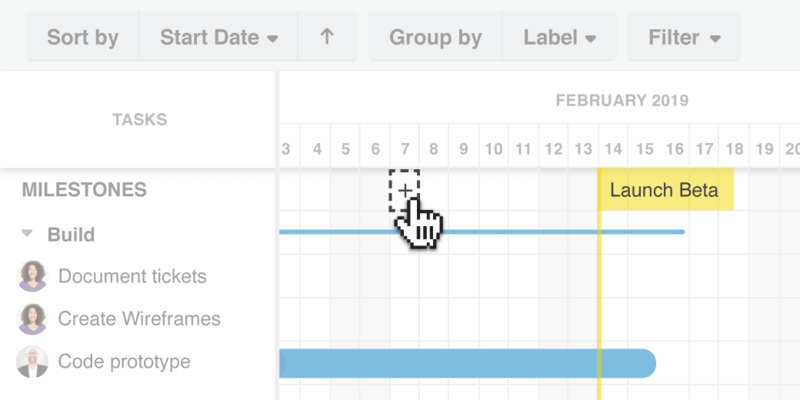 Once created, your milestones will appear above your Elegantt chart and will be visible for all your team members. You can edit a milestone at any time by simply clicking on it.